Even though you’re likely used to getting your utility bills in the mail each month, that doesn’t mean that you enjoy the routine. Depending on the size of your home, the condition of your home and the number of people in your home, you might have to pay an arm and a leg to heat it during the winter and to cool it during the summer. But there are some things you can do, such as getting Midland, ON replacement windows, to keep more of your hard-earned cash. You might be surprised at how much money you could be throwing away because of any energy inefficient appliances you may still have in your home. There’s a reason why the Energy Star label, which is used to show which appliances offer considerable energy efficiency, is sought after. It might not be feasible to swap your washer, dryer, dishwasher, fridge, stove, freezer and other appliances all at the same time. But you can gradually upgrade to appliances that will sip, rather than guzzle, electricity. This will result in lower energy bills and a positive ROI. How well is your home insulated? A lack of insulation can make your residence chilly during the winter and steamy during the summer. If there’s an insufficient amount of insulation in the attic, get that remedied as soon as you can. Don’t forget the insulation in the walls. Once your home is properly insulated, your HVAC unit won’t have to run constantly just to maintain the desired temperature. This will prevent premature wear and tear on your HVAC unit and make the interior of your home more comfortable for you, your family and your guests. Are your windows drafty? In other words, can you feel a draft coming in anytime you’re close to the windows? Your first order of business should be to see if there is a reliable quick-fix solution. So try caulking and weather stripping. But if these measures don’t work, your best bet is to get the replacement windows you need for your home. No one has to remind you that winter in the Great White North is no laughing matter – unless you love to snowmobile, ski, skate, ice fish or participate in other outdoor activities during the wintertime period. Contact a professional replacement window company if you want an expert opinion on whether to get new windows or to replace the ones you already have. In this day an age when many people are looking to reduce their carbon footprint and be better stewards of the environment, it’s a good idea to reduce your energy consumption at home. One strategy that’s sure to help you in this regard is Midland, ON replacement windows. 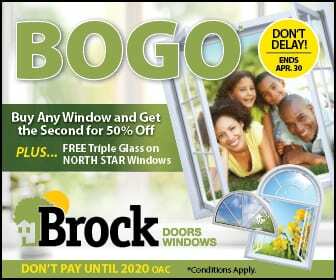 At Brock Doors and Windows Ltd., we have you covered when you need new windows. We have a wide selection of replacement windows and we offer expert installation services. Come by our Innisfil location. For a free consultation, call us at (705) 431-7087. You can also stop by our office at 2347 Industrial Park Rd Innisfil, ON L9S 3V9 during regular business hours to talk to someone in person.